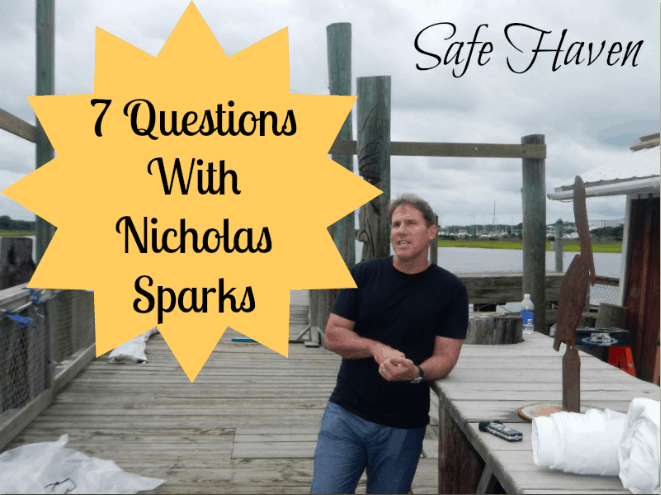 This summer I had the opportunity to pop down to Southport, North Carolina to the set of Safe Haven, based on the novel by Nicholas Sparks and starring Josh Duhamel and Julianna Hough and chat with Nicholas Sparks himself. 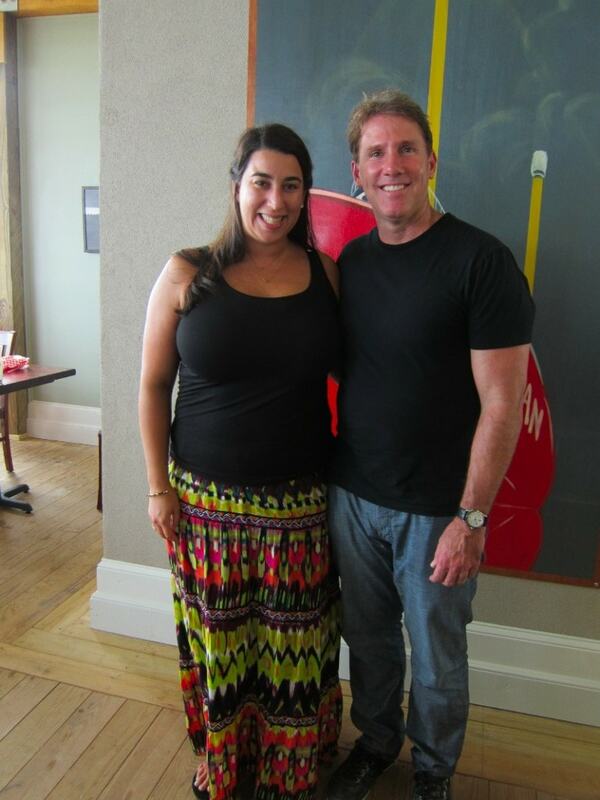 One of the most endearing things about Nicholas Sparks is how invested his is in his characters. 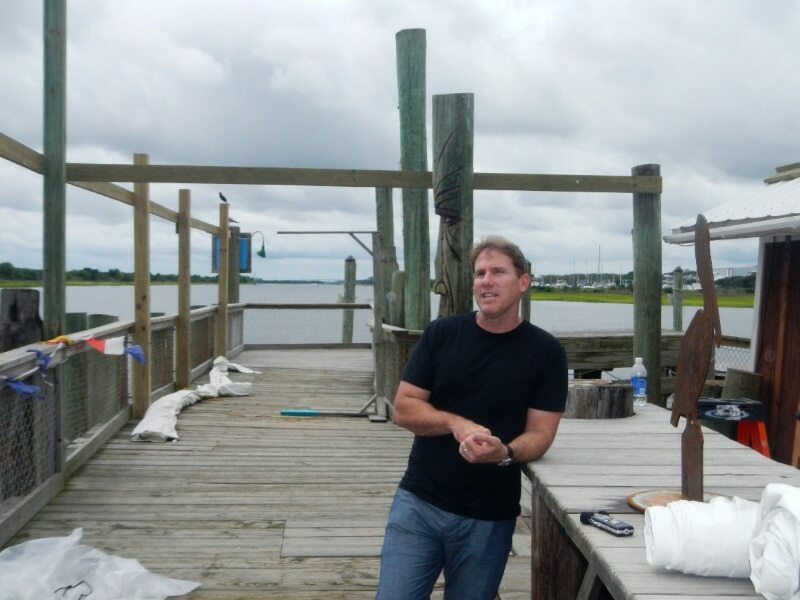 When Nicholas Sparks speaks about one on his characters, it’s as though he is speaking about a dear friend or telling you about one of his children’s recent accomplishments. (See photo below, left, of Nicholas Sparks discussing how his Safe Haven protagonist Alex constantly strives to be a great father). This connection with his characters is truly what makes his stories so relatable and gives his novels (and films!) such broad appeal and critical acclaim. The really interesting thing about North Carolina, it’s one of the reasons why I set the stories here and why this particular place is perfect is that it’s a very unique state in that, unlike virtually every other state, the big cities are off the coast because of the hurricanes. The entire eastern part of the state is dotted with small towns. The biggest town is Wilmington, about 150,000. And that’s huge. I mean, Southport has a population of 1,500. And it’s a great place where someone like Katie could wander in and there’s never going to be anyone from Boston that you’d ever happen to bump into here. So, that’s what you’re looking for, just one of the great places. There’s a few of them. What you really look for is a level of performance that really shows the depth and complexity of a character. These characters have to feel very real. You have to sympathize with them. So, there was a great scene with Alex in the canoe. He and Katie are getting to know each other. He’s taking her out on a date. It’s kind of their first date, and he’s getting to know her. And he says, “This is my favorite place. You know, I used to love coming to” –and she says something like, “You used to bring your wife here, right?” And there’s just a quiet moment there. And then he starts talking — you’re trying to get him to come across that he loved his wife very much. He’s really sad that she died. And it was awful, and it was terrible. But, you know what? He’s kind of mad that she’s dead, you know, ’cause he’s got two kids. He doesn’t know how to be mom and dad. He’s got to run the store, he’s got to get them to the school. And he feels guilty about feeling this and that’s a very real genuine emotion that a guy in this position would be going through, you know, because you’re mad. Then you feel guilty about it. But, you still love them, and you miss them. Now, capture all of that in 15 seconds. 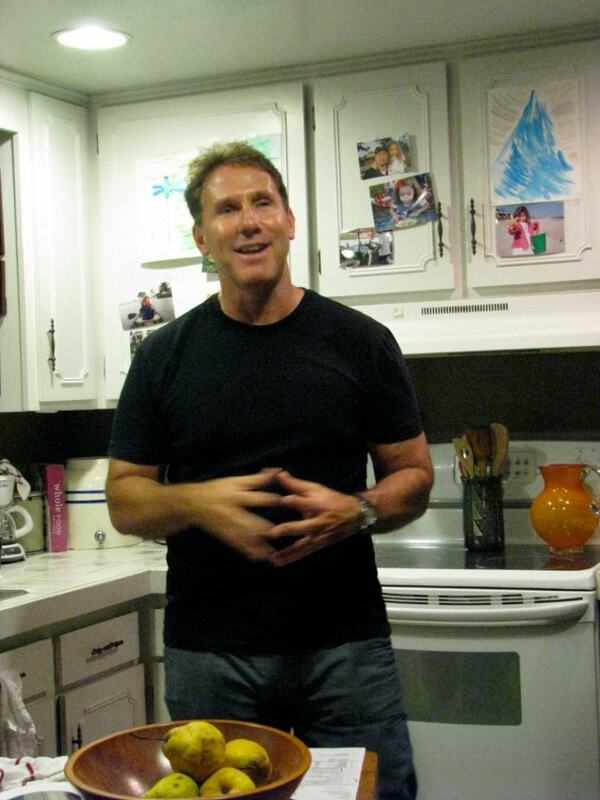 A Nicholas Sparks character would be, the glass half-full type of character. Yes, they have flaws. Alex, he gets frustrated. He’s lonesome. He has problems, right? He’s got his own baggage. He’s a nice guy at heart. He tries to be the best dad that he can and run his business. And you know, you’ve got the guilt of bringing someone new into your kids’ life. And what if they’re not the right person, you know? Some people never think of that. But, I think eight out of 10 people do. Before a single word is written because what you’re looking for is three things. You’re looking for things to be interesting, original, and universal. That goes to the theme of the story, the journeys of the character, but also the specific elements in the book. For example, one of the questions I always have to answer is, “What’s an interesting, original, universal way for the characters to meet and come together.” It is really easy to do two of those three. Original and interesting, and you get Hannibal Lector. But, he’s not universal. You don’t feel as if you can know him. So, in The Notebook, the character climbs up on the Ferris wheel, and he dangles, right? But, it seems realistic. You can see him doing that. But, you’ve never seen it before. You’d never read it before. You’d seen John dive off the pier to save her purse. You’ve never seen it before. But, it seems like it could happen. Someone finds a message in a bottle. You’ve heard of that. But, you’ve never seen it. So, that’s really what you’re looking for. So, the conception of a story and the elements within the story — I do have to think about that because it needs to meet those three criteria for both novel and film. But, then once I have those things sorted out, I sit down to write only about the book. What you do when you’re among the many decisions you make in the creation of one of my novels is we all know it’s a love story, right? We all know that. It’s love and something. You can have love and mystery, love and forgiveness, love and loss, first love, right? You can have all these things. This was love and danger. I chose love and danger because it’d been a long time since I’d done one. I did that with The Guardian. The Guardian was a stalker-type danger. A woman goes out on a date one time with a guy, and he will not go away. The guy is psychotic and nuts. That was a stranger danger. For Safe Haven, it could’ve been a female danger. It could’ve been a guy. But, I thought, “Fatal Attraction is still such an iconic film.” But it’s not as relatable. I mean, the reason that worked is like, “When does this ever happen?” And so, it kind of fell in place. If it’s not a stranger, it’s someone she knows. And so, then we say, “Well, how do you do it different than anyone’s ever done it before because we’ve all seen Sleeping with the Enemy or The Burning Bed? How do you make it new?” So, it’s all about making it original. Make it original. Make it original. Safe Haven, based on the novel by Nicholas Sparks and starring Josh Duhamel, Julianne Hough, David Lyons and Cobi Smulders is in theaters February 14th. Watch the official trailer here.